“Here is your task: You must find our former king. Discover why he renounced the mediocracy. Return and swear you’ll never aspire to be any greater or less than expected and you shall be our new king.” (Kindle Locations 876-878). James is average. 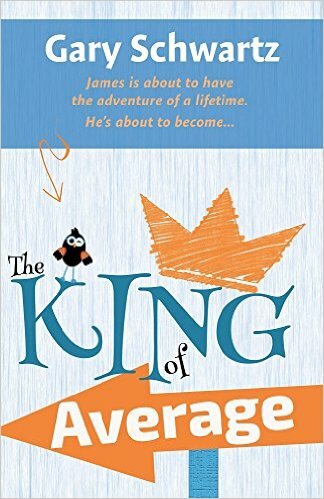 After finding himself in another world where there are talking goats and little birds, he is invited to apply to be King of Average. James fancies himself the most average kid in the world and thinks this a mighty fine plan. To be the King, though, he must go on a quest to find out what happened to the previous King of Average (now missing and why they need a new king). Along the way James will discover that he is more than just average, that he can be loved and appreciated, and that he is capable of doing exceptional things. Gary Schwartz has written a delightful middle grade novel that is funny and fun to read for all ages. I know that I would have loved this as much as a younger reader as I’m enjoying it as an adult. As an adult I’m enjoying it for the language and puns. As a young reader I would have enjoyed it for the story, fun situations, and fun characters. I love the little images throughout the story. After the initial premise and plot was explained, the book got a bit boring because the immediate tension let up and only James’s goal of being King of Average kept the story going as he was constantly interrupted in his mission by the whimsicality of the funky characters and the oddness of the interesting setting. This novel was published by Updrift on October 7th, 2015 and is available on Amazon here.